ISO here is not the abbreviation of a famous organization, but a file format referring to CD/DVD image with “.iso” extension, which is composed of full content of CD/DVD disc like directory, tracks, file and information about the structure of the disc. Many people love to save their favorite DVD as ISO files for backup on computer. As to ISO image playback on your Windows or Mac OS X PC, you must utilize some specified players like VLC and 5KPlayer. If you get used to the iTunes feature and want to import your DVD ISO files to iTunes, there is also a smart solution: converting your ISO files to iTunes friendly format, i.e. M4V, MOV or MP4. To convert ISO to iTunes seamlessly and effortlessly, Brorsoft Video Converter Ultimate is what you need. It provides fast access to high-qualified and easy-handled converting and converting from DVD ISO files to virtually any video formats, SD version and HD version. Meanwhile, it directly offer presets for iOS devices and Apple TV, so that you can import the converted files to iTunes smoothly and play them perfectly on your iPhone, iPod, iPad, Apple TV, etc. The process is straight forward. After downloading, follow the wizard to install and run the program. Then follow the steps below to convert ISO to iTunes-friendly videos in a few clicks! The below guide takes the program’s Windows screenshots for example. If you are a Mac user, you can turn to the Mac version, which has the same function as the Windows version. Install and launch the ISO to iTunes Converter and click “Add Video” button to add ISO movies from your computer. All the loaded files will be listed on the left item bar and you can preview them on the right as the picture below shows. If you do not have a ready folder, create one where you can easily locate it. The video formats available are M4V, MP4 or MOV. You can select one of them from “Common Video” category. 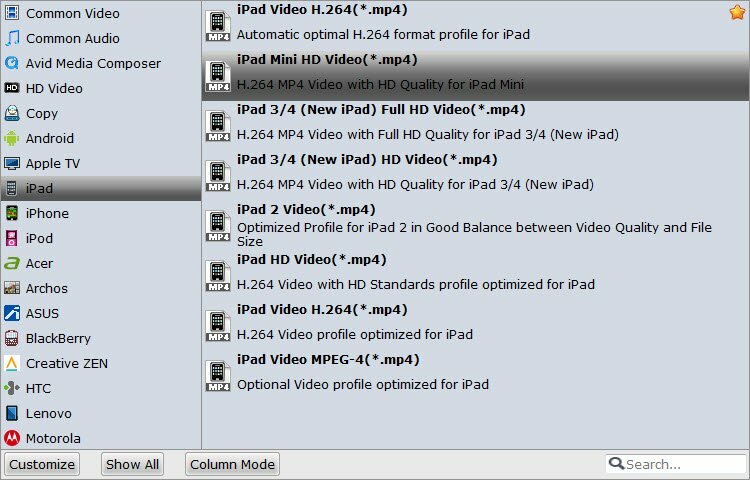 If you want to sync the converted video to a specific devices like iPhone 6S, iPad Pro, iPad Mini, iPod, or Apple TV, you can choose your device model from an array of device-specific profiles. After selecting your desired format and the destination file you can opt to make changes or settings and if you are OK with the way the format is click the “Convert” button to initiate the conversion. When the conversion is done, please open iTunes on your Windows computer. Then click “File” menu on the left side of iTunes toolbar, and choose the “Add File to Library” option. After that, open the output folder that contains the videos to select the file and click “Open”. Now you can get ISO file imported to iTunes successfully.